When it’s this cold I think about the birds often. Well, I pretty much think about birds all the time, no matter what the weather. When it’s bitter cold or windy and stormy, I worry about them. I remember reading something about how a chickadee, having spent overnight in extreme cold, has only enough caloric resources left to find food within two hours in the morning or it will not survive. I find that worrisome. Just yesterday when I was thinking and worrying about cold little birds, a friend of mine posted a photo of a chickadee on a snowy tree branch. It’s a Carolina chickadee (Poecile carolinensis). A tiny little bird, a chickadee weighs about as much as two nickels. My friend has been thinking about birds, too. I don’t know if she is worrying, but she does put out food for them. She got herself new binoculars and watches birds from her office window. Her office is on an elevated level of a barn-like building facing into the woods, in eastern Pennsylvania. She is basically sitting up in the tree canopy. How cool is that? I am delighted that she is finding pleasure in seeing birds. What I found out about chickadees is that they will consume 30-60% of their own weight per day in high fat food, like seeds and insect eggs, (during the day their body temperature is a warm 108°F), and on a cold night they will go into a state of regulated hypothermia- actually lowering their temp by 20 degrees, tuck into a small hole in a tree and shiver all night, using up the excess body fat to sustain them. Lowering their body temperature, which slows their metabolism, leaves enough energy to get them through to breakfast, if it all works just right. Can you imagine spending the night out in the cold with a temperature of about 75°F, shivering the entire time, and then racing out at daybreak to find food? Another study shows that whether the small birds fed at feeders or foraged on their own had no effect on their body weight and loss in an average weather. But, when temps drop below 10°F, supplemental food like sunflower seeds at feeders made a significant difference in their survival. So, I hope you will consider putting out some high-fat seeds for the chickadees and other tiny little birds as we go into another deep cold spell this week. 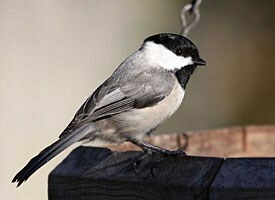 And I hope you will have the pleasure of seeing a chickadee. This entry was posted in Uncategorized and tagged bird-watching, birds in winter, chickadee, extreme cold, poecile, regulated hypothermia on February 19, 2015 by elizabeth.